Libby Oughton is a poet and publisher from Prince Edward Island. Her 1988 collection,getting the housework done for the dance, is one of the most successful books of poetry published by an Island author. Oughton bought Ragweed Press, the foremost press operating out of Prince Edward Island, in 1982. Soon after she oversaw the publication ofIsland Women: Our Prose and Poetry, and soon set up Gynergy Press, an imprint of Ragweed devoted solely to women’s writing. Gynergy continues to publish exclusively feminist and lesbian writing, though Oughton has since sold the company. As a result of her commitment to publishing Island writers, Oughton has been instrumental in fostering literary production in the province. Oughton occasionally writes for Buzz Magazine, Prince Edward Island’s monthly guide to local arts and entertainment. park. i am alone. dark. afraid. dark. dark. d/ark. arch your back under me. feels better. arch enemy. enema. clean me out. witches' blood. all the diapers. remembered where you'd left the keys. her inside my chest. zip. unzip. zip. vacuum floors. dark corner. spotless too. hidden underground. under ground. where i yearn to be. parked. buried. forgotten. i can't stand this. marriage. merry/age. time-saving utensils. park your mind here. this is my kingdom. king/dom. dome. rules are clear. please make sure. every day. stick them. in to you. just like you stuck it. in to me. you the pin cushion. you. pinned down. pinned up. poked. penetrated. diaper pinned. folded together. folded. the way you demand. i put them in the closet. man. deep in night. baby detaches from my chest. good. good man they say. i am born for your good. basket. silent. fold myself in. wash and stack diapers. straight. you park underground. you are kind they say. father. this man in the morning. this man in the night. peck peck at me. peck. pecker. wood pecker. pecker. wooden inside of me. parked in me. parked. laundry basket. put it on my nose. keep out skunk. this marriage stinks. i am un/happy. i am paralyzed. snakes park in every corner. their tongues reach. marriage is a pale facsimile. pail. wash floors again. repeat and dissolve. i am dissolving. in this dream. and hotter. baby wraps around my heart. grows roots. don't have. have nothing. i am nothing. i am. not. don't. look. how much more of me do you need. look. is it. this is not. a life. i told you so. i told told told you. this is life. help. help. help. this is not it. just open yr legs again. this is it. take this. and this. and this is all you will ever get. girls. SaFety pINs. safety. SAfE. i aM not. crazzzzzZy. this baBychild wrAps. pArks in mY heArt. fills tHe lasT sPAcE. yeLlow lines. last pArking. lot. heart. and sLip away. a way beyonD you. Published in getting the housework done for the dance (Williams-Wallace, 1988). Critical Analysis: Domestic Entrapment in Libby Oughton's "Heh! Paradise"
Libby Oughton's “Heh! Paradise” details the life of a woman trapped in her domestic situation. Entrapment in domestic life has been a focus of scholars for decades, as they detail “the disjuncture that...existed between the private world of the home and the family and the public world of work and politics in the post-war era” (Johnson and Lloyd 119). By the late 1940's and early 1950's, the post-war housewife was “diagnosed...as living in a state of boredom and dissatisfaction” (Johnson 120). Oughton's work, in particular, is heavily situated in the time that it was written. Writing fresh off the heels of the second wave of feminism, Oughton's speaker rejects and resents her expected role as housewife in “Heh! Paradise,” instead promoting a deeper understanding of gender roles and choice. baby. shine sun. spotless (7-9, 18-20). In shining not only the furniture but also herself and her child, Oughton presents her speaker as an object rather than a subject in her own life. Even though her speaker has ideas, she is given no means to express them, and as a result emotionally removes herself from her life. With such language, Oughton's speaker is reduced to an object. Constrained, she is unable to live her life for herself, and is instead living her life for others. Moreover, Oughton speaks to the religious tale of women's creation: as her speaker's husband proclaims “i-am-your-god-i-am-your / right-to-life. i am man” (33-34), the speaker as a wholly realized individual disintegrates. Rather than being a person in and of herself, Oughton's speaker is instead measured against her husband and considered as a person only in relation to him. Due also to “an increasing expression of feelings of boredom and isolation on the part of women at home” (Johnson 131), Oughton's use of form in the work chronicles not only a daily routine, but a mental deterioration. Johnson, Lesley and Justine Lloyd. Sentenced to Everyday Life: Feminism and the Housewife.Oxford: Berg, 2004. WorldCat. 18 Aug 2011. Oughton, Libby. “Heh! Paradise.” getting the housework done for the dance. Toronto: Williams-Wallace Publishers, 1988. Print. 11-12. 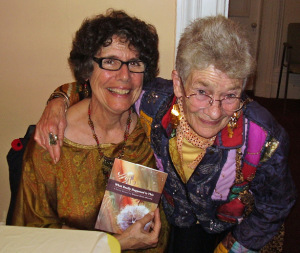 Dykewoman, Elana, Judith Barrington, Libby Oughton, et. al. Dyke Proud: A Lesbian Poetry Reading from the 3rd International Feminist Bookfair. Montreal: Annor, 1988. Cassette. Oughton, Libby. getting the housework done for the dance. Toronto: Williams-Wallace Publishers, 1988. Print. ---. “The Human Comedy: The Legacy of the Late Erica Rutherford.” BUZZon: Arts and Entertainment on Prince Edward Island, Canada. The Buzz Magazine, July 2008. Web. 5 March 2012. ---. “Sooner or Later All Bodies Tend to Move Toward the Centre of the Earth.” Frictions: stories by women. Ed. Rhea Tregebov. Toronto: Second Story Press, 1989. Print. ---. “Tributes to Hilda.” BUZZon: Arts and Entertainment on Prince Edward Island, Canada.The Buzz Magazine, February 2008. Web. 5 March 2012. Fiamengo, Marya. “getting the housework done for the dance.” Rev. of getting the housework done for the dance, by Libby Oughton. Journal of Canadian Poetry: The Poetry Review for the Year of 1988 5 (1990). Print. Morrissey, Stephen. "Getting the Housework done for the Dance // Review." Rev. of getting the housework done for the dance, by Libby Oughton. Poetry Canada (1989): 90-94.CBCAComplete. Web. 8 March 2012. Welch, Liliane. “getting the housework done for the dance [by] Libby Oughton.” Rev. ofgetting the housework done for the dance, by Libby Oughton. Atlantis 13.3 (1988): 145. Print.